Sarah's Silks generously provided us with these lovely silks to play with at our request. 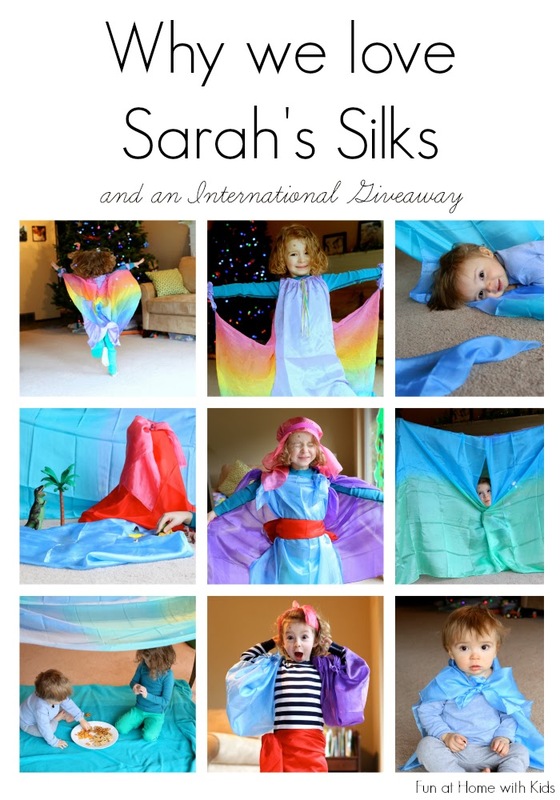 My opinion was not swayed by the free product because I already loved Sarah's Silks! 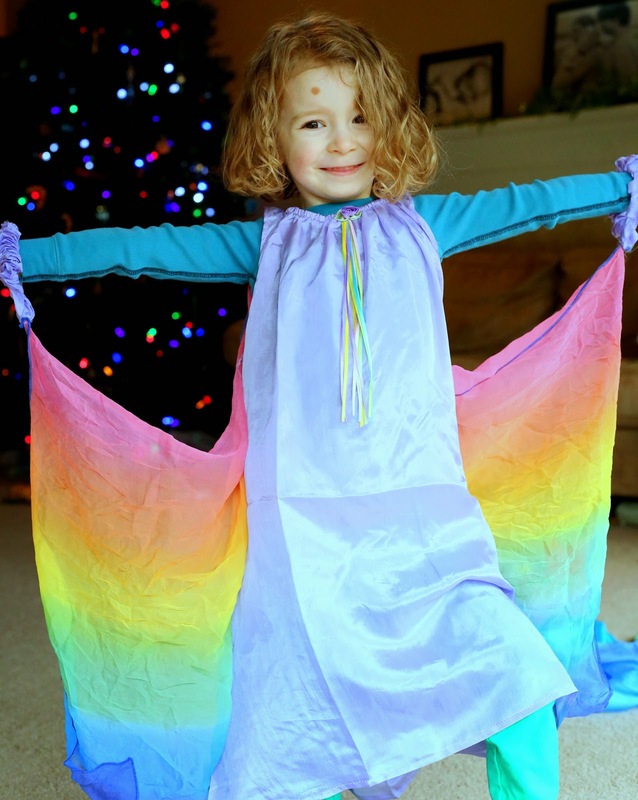 S got her first Sarah's Silks product when she was 18 months old - a rainbow cape - and we've been in love ever since. There are so many things to love about playsilks. The vibrant colors and magical ethereal movement inspires such fabulous imaginative (and energetic!) play. S and I thought it would be a neat challenge to see how many ways we could play with the silks we received. 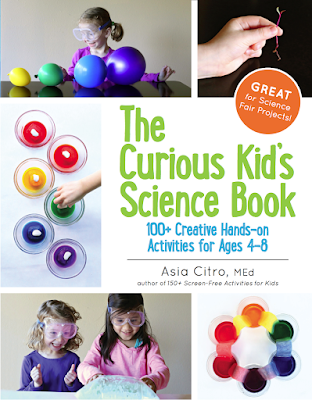 There are surely an unbounded number of ways they can be used (love that! ), but here were some of our favorites. First and foremost, they make amazing capes. 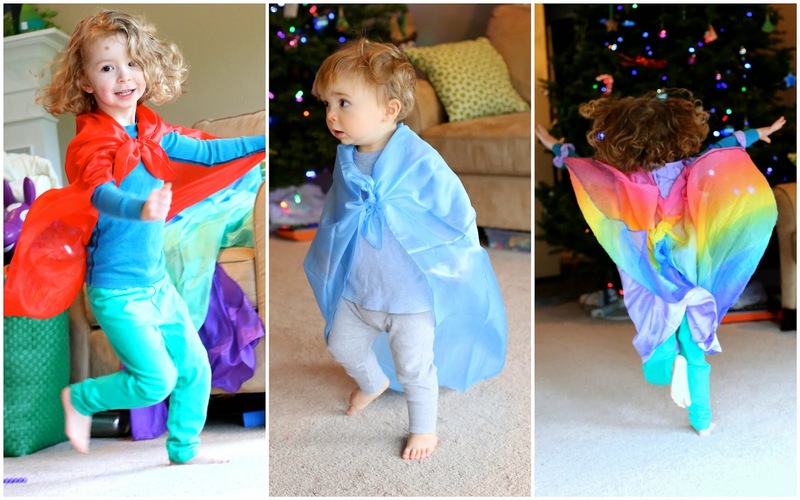 Sarah's Silks makes a full line of capes, and many of their costumes (like the gorgeous rainbow-winged fairy costume S is wearing on the right) have flowing wings - but even the basic playsilks can be tied into capes easily - as X and S are demonstrating on the left and in the middle below. 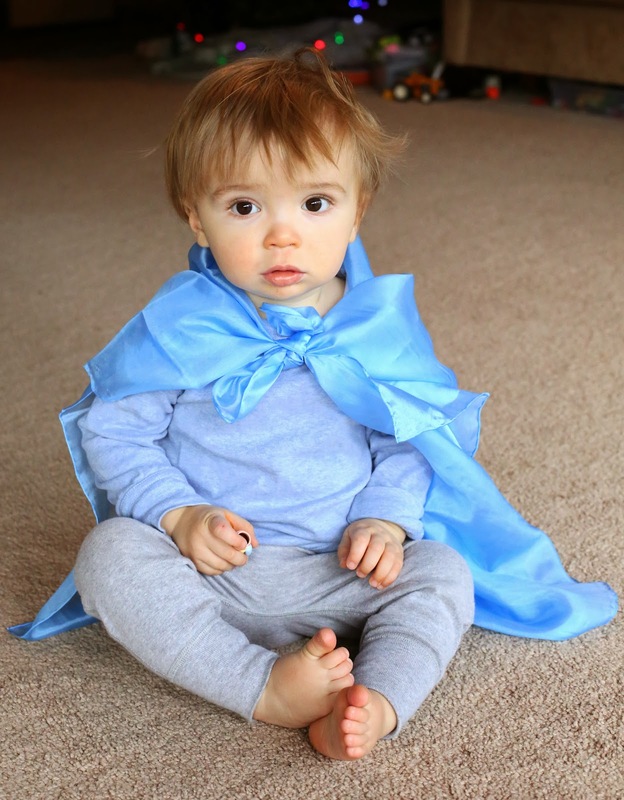 Just a warning though - these capes make your kids REALLY fast - so they might be hard to photograph - ha! S and I are fully convinced that the fairy wings on this fairy costume are magical. This beautiful, light, and airy fairy costume can be worn over clothes or by itself. S, at 4, is able to get this on and off by herself. The way the wings move as she runs is simply enchanting. The playsilks are silky smooth, as you'd suspect. 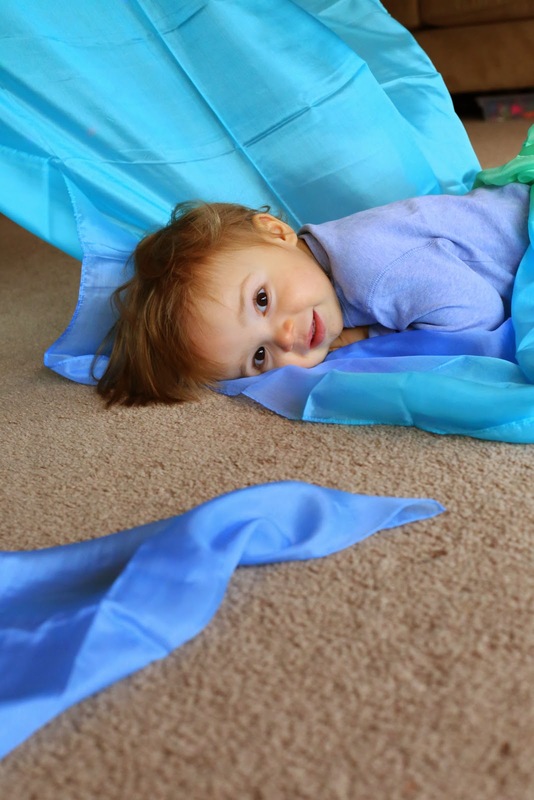 X loved rolling around on the larger silkscapes and having sis and I flutter them overhead. It's easy to become entranced by the flowing, rippling movement of the silks! Next, using four chairs with ribbon strung between them and two sea silkscapes, we made a giant fort for the kids to play in. S even put on a short puppet show for me! We even created a few small worlds out of silks! Here we used a large silkscape as a backdrop and folded a blue playsilk in the shape of a lake. I took a paper towel roll (with paper towels still on it - ha!) and stuffed a red playsilk partially in the top. I spread the rest of the playsilk out to style it like a red volcano and tucked a pink mini-playsilk over the top to create flowing pink lava. S and I added a few dinosaurs and a Playmobil palm tree to complete the scene. 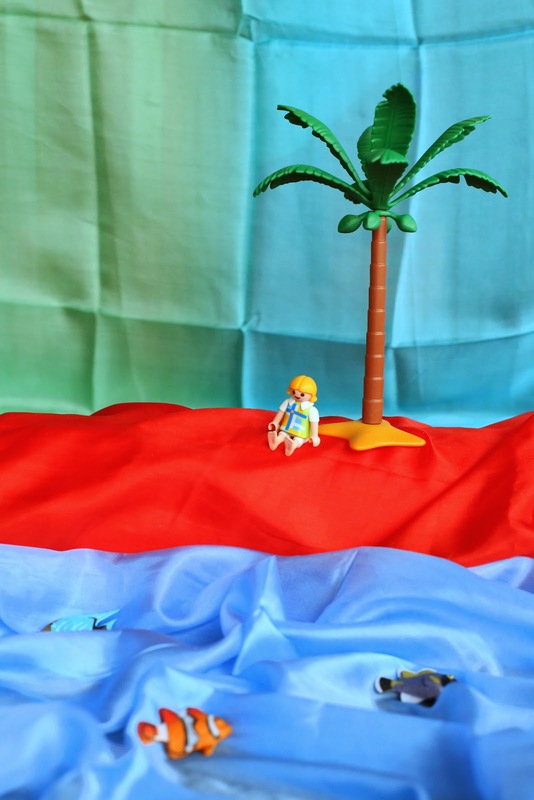 Later we created a different small world - again using the large silkscape as a backdrop. 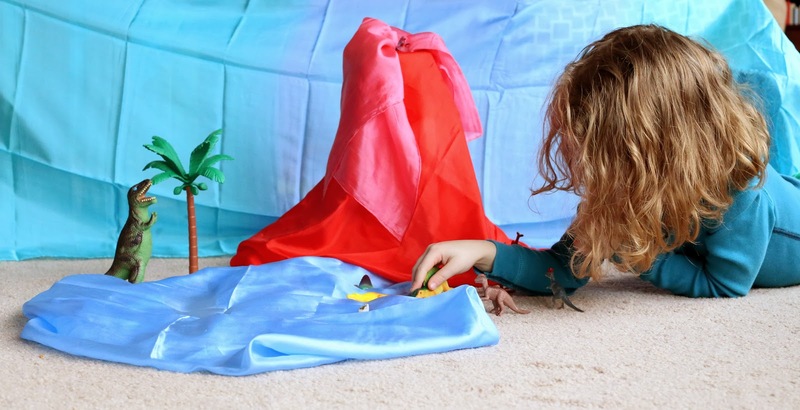 We made a red beach by folding up a red playsilk and I rippled a blue playsilk to create an ocean. S and I again added some loose figures to complete the scene - a Playmobil palm tree and beachgoer and we added a few fish to the ocean. 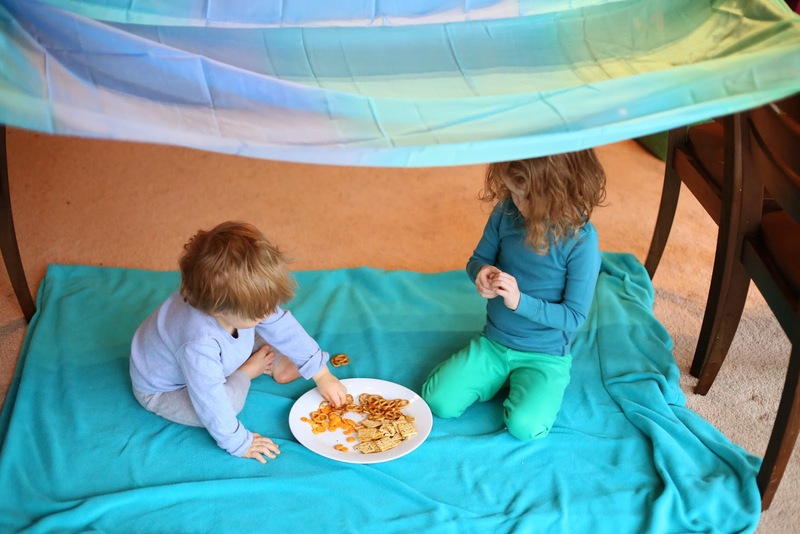 After all that playing and running, X and S were ready for a snack - so I created a canopy tent while S prepared "a feast!". I used four chairs and loosely knotted the two silkscapes in each of the four corners. Then it was time for more dress up! 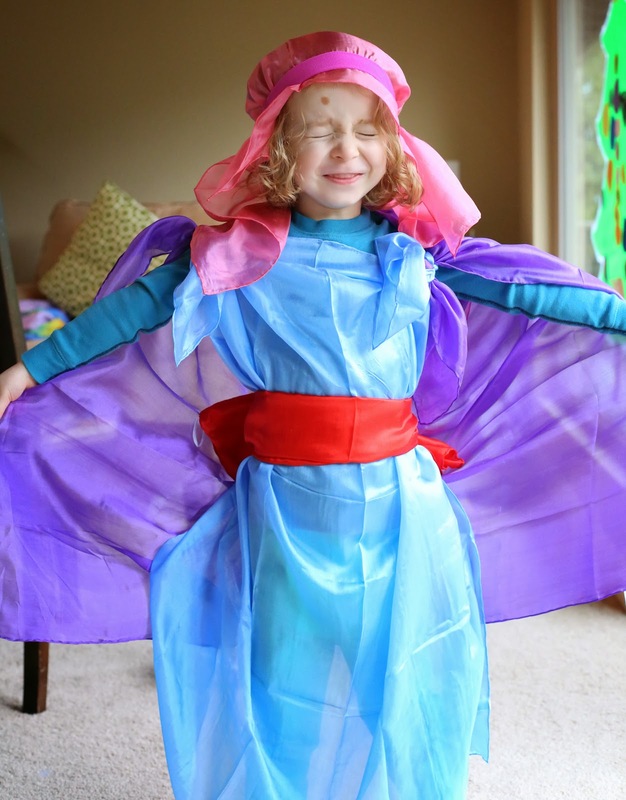 Here S has a blue playsilk on her front, a purple playsilk cape, a folded red playsilk belt, and a headpiece made of a pink mini-playsilk with a stretchy headband laid over the top. 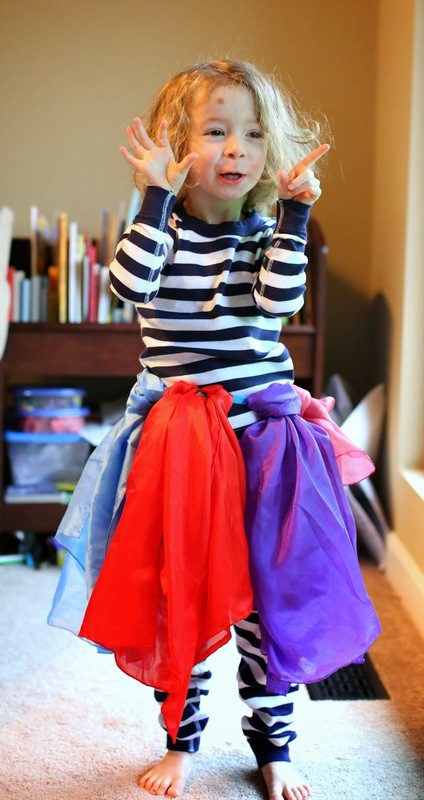 Next we made a skirt by looping our three playsilks and one mini-playsilk over a stretchy headband that we put around S's waist. And finally - a red playsilk skirt, a pink mini-playsilk headband, and blue and purple playsilk wings. If you can't tell by S's expression below - she had SO much fun dressing up. Hahaha! 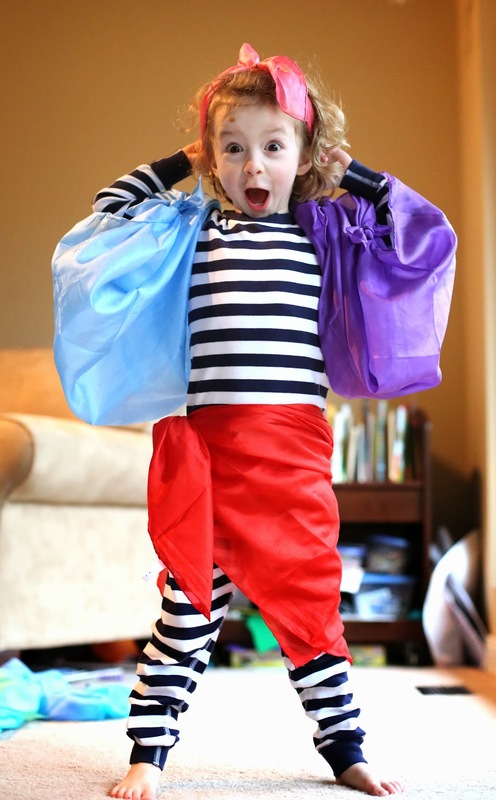 Not only do Sarah's Silks lead to fantastic imaginary play, but they are incredibly high quality; they are dyed using non-toxic, non-hazardous, and environmentally friendly dyes and are easily handwashed. 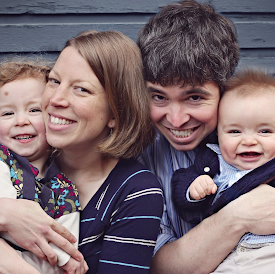 Sarah's Silks also prides itself on its family-centric business model. Her family runs this business out of their home so that they can be with their children - and they afford their employees the same experience. The silks are hand hemmed and dyed by seamstresses in China - in their own homes (not in factories). The finishing touches (such as ironing and packaging) take place in the US - again in the employee's homes. So not only a lovely product - but a lovely company as well! Sarah is generously offering two $50 credits to her amazing store - and she is willing to ship Internationally - so this giveaway is open to all entrants! Yay!!!! Thank you, Sarah! For your chance to win, see the Rafflecopter widget below. Be sure to check out Sarah's Silks to figure out what you'd spend your $50 on if you win! Two different winners will be selected at random by Rafflecopter on Monday, January 27th. I will contact the winners and they will have 48 hours to respond. In the event that a winner is unresponsive, an alternate winner will again be chosen at random by Rafflecopter. Wow, these are so gorgeous! We would have so much fun playing with them. Thank you, Jessica!!! They are SO much fun to play with!!!! These playsilks are just wonderful! the kids look like they are having so much fun. We had a little one when our youngest son was a baby, would love to win some for the boys, such a great way to encourage imaginative play! Fingers crossed for you, Natali!!! These silks look incredible! And fun! i have a couple, and i think they are my fav 'toy' - in fact last night my little one wrapped her 'itchy' hot waterbottle in a silk… not itchy anymore…. shw was just cold! 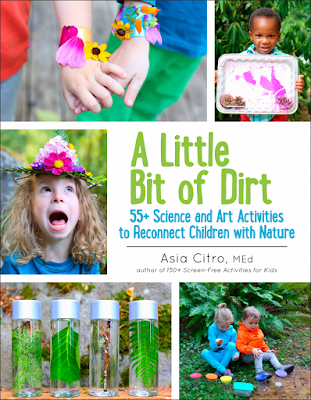 thank you - and i have to say i LOVE your blog - by far my fav kids blog… you rock! You're so creative! I would love to use these for my guy and the littles ones I take care of while their mommy is at work. What a giveaway! I had to click enter for financial hardship because my Dad's currently got cancer and we are going to be footing a hospice bill that we really can't afford, but it's the only option for his last few months. Would love to win this, we love silks! Oh I'm so so sorry to hear that, Tracy Euler. Our thoughts are with your family!!! Gorgeous . . . both the silks and the photos. I have heard of Sarah's Silks but never used them before. :) Thanks for sharing them with us! Aren't they the best, Alison?! I totally agree with you! Thank you for the give away. Love Sarah's Silks! 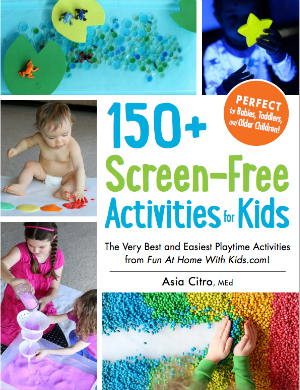 We usually use them for peek a boo, dance movement and building forts. Love your suggestion of a skirt. Oooh, I bet they are perfect for dancing!!! I love the parachutes and the cotton playcloths as well. We use playsilks on an almost daily basis! The starry night one is awesome! That's so awesome! And oh yes, the Starry Night print is one of my favorites!!!! I haven't!! I know you have that lovely tutorial, but I am such a sucker for the gorgeous colors Sarah gets - the sea silkscape is something to behold! The silkscapes are some of my favorites, too, Golden Storm! They are just SO gorgeous! Thank you, Ena! They really are so fabulous for dress up!!! These photos are just too beautiful! I swear, you have the cutest little one's!! You are so creative! I wouldn't have thought of mini-worlds with silks. Amazing!